The Geminid meteor shower peaks tonight (Dec. 13), but interested skywatchers might have to battle chilly temperatures and bright moonlight. The annual Geminids shower is usually one of the most spectacular light shows of the year, but this time around, the vivid and nearly full moon is threatening to take center stage instead. On Dec. 10, lunar observers were treated to a stunning total lunar eclipse, and the moon's dazzling light in the night sky is expected to make it difficult to spot Geminids as the shower reaches its peak tonight. "This year, folks will get a nice double whammy with the lunar eclipse on the 10th, and then the Geminid peak on the night of the 13th, but it would be nice if we could just turn off the moon after the eclipse," Bill Cooke, head of the Meteoroid Environments Office at NASA's Marshall Space Flight Center in Huntsvilla, Ala., told SPACE.com. The annual Geminid meteor shower has become known as one of the most impressive of the year, sometimes even eclipsing the more famous Perseid meteor shower that occurs every August. 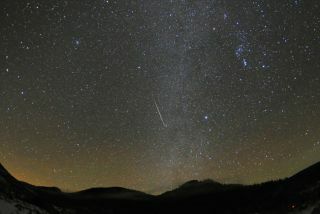 The Geminids shower also features slow and bright meteors, with some of them appearing yellowish in color, said astronomer Joe Rao, SPACE.com's skywatching columnist. On a clear night, skywatchers have reported seeing up to 120 meteors per hour during the peak of the Geminids in previous years. This year, however, skywatchers will likely see about half that rate, Cooke said. Occasionally, the Geminids can produce stunning fireballs, and if that happens this year, they should be bright enough to see even with the moonlight.